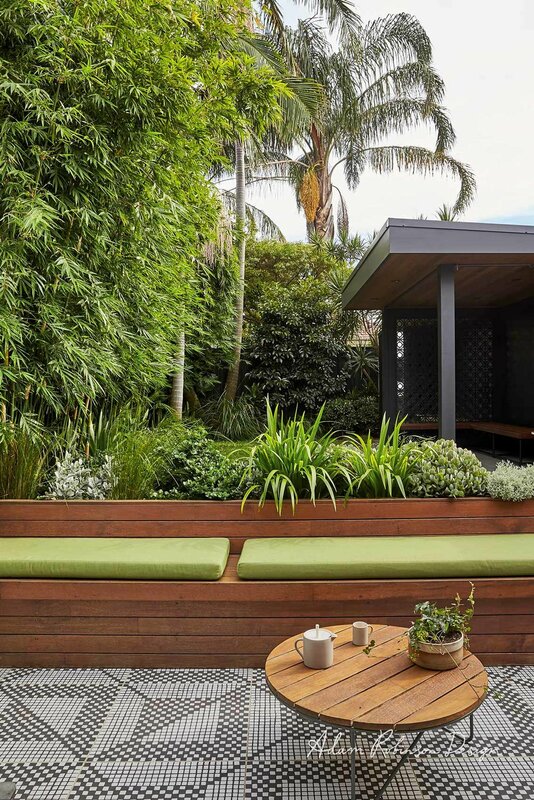 With this garden I really wanted to create an atmosphere of private seclusion with a real sense of being able to get away from it all in a tranquil, green oasis. I think we did it! What existed before was pretty much an open space from the back door of the house to the garage door, part of it decked, part lawn and part paved. The cars were parked in the garden. 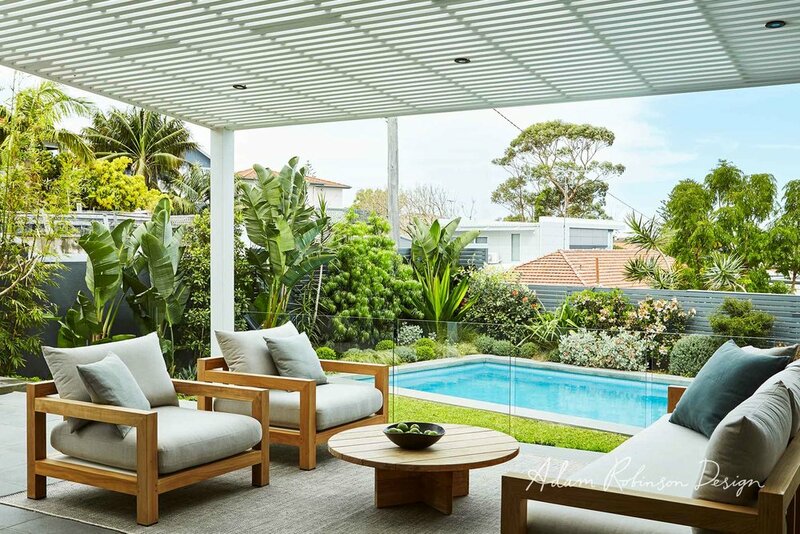 We came up with a great solution for a design that still accommodates the cars, however you don’t really see them anymore as they are concealed now thanks to some very smart decorative metal sliding screens that separate the carport area from the rest and recreation zone. 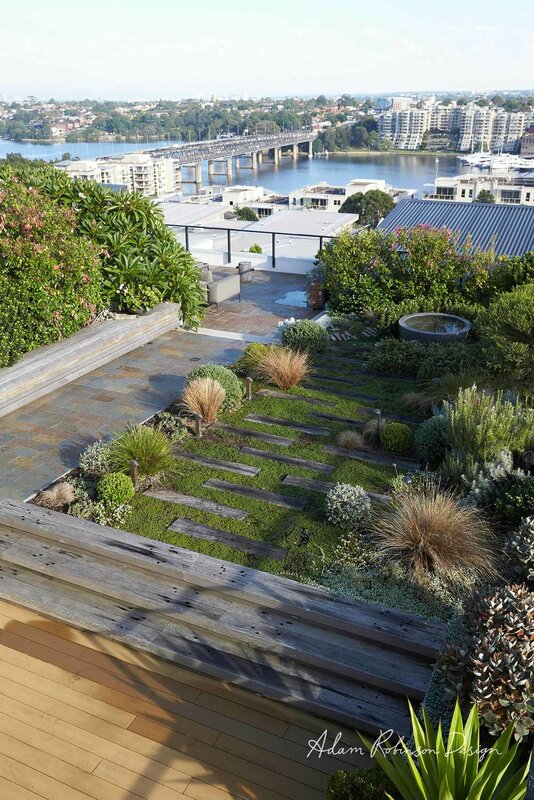 The courtyard garden is now a space for living and enjoyment with large format steppers made of outdoor timber-look plank tiles which are softened with plantings of Mondo Grass in between. 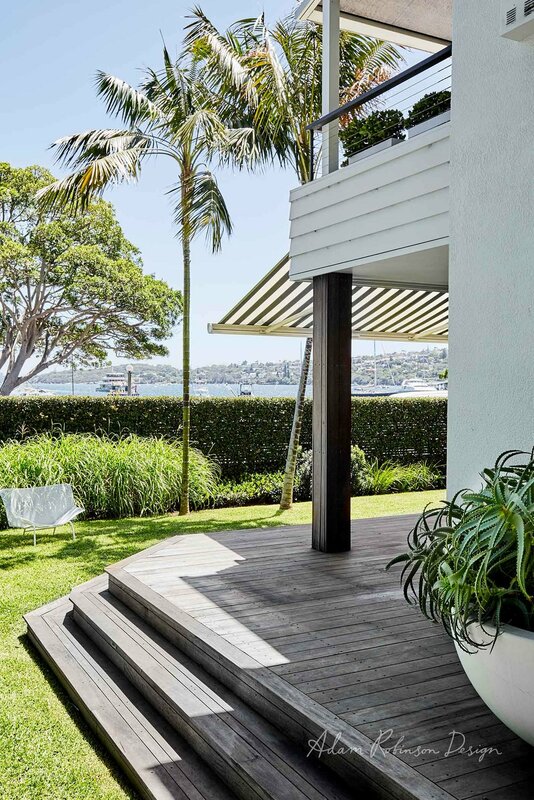 The timber tile cleverly continue the timber floor of the interior through to the exterior space. 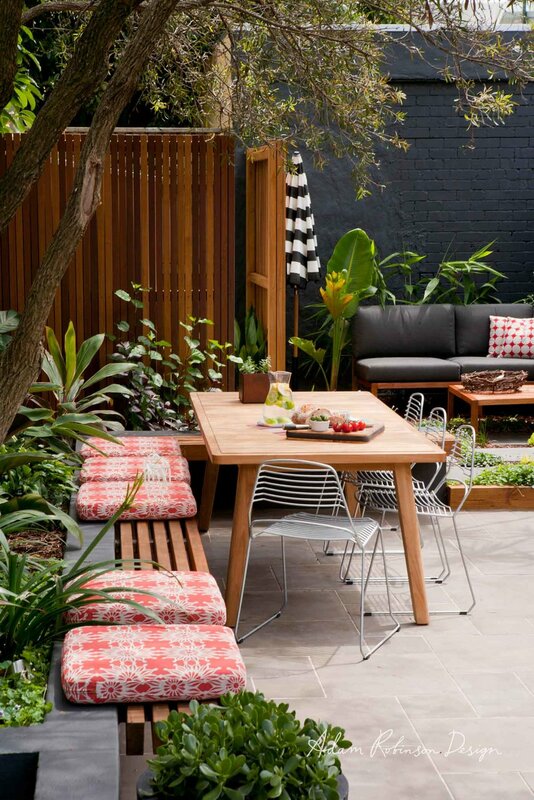 L-shaped built-in bench seating is a generous amount of seating for quite a few friends to gather and celebrate different occasions, making the most of limited space. The addition of extra armchairs and occasional tables create a comfortable conversation corner. Gorgeous patterned tiles peep out from beneath the benches for some unexpected colour and fun. 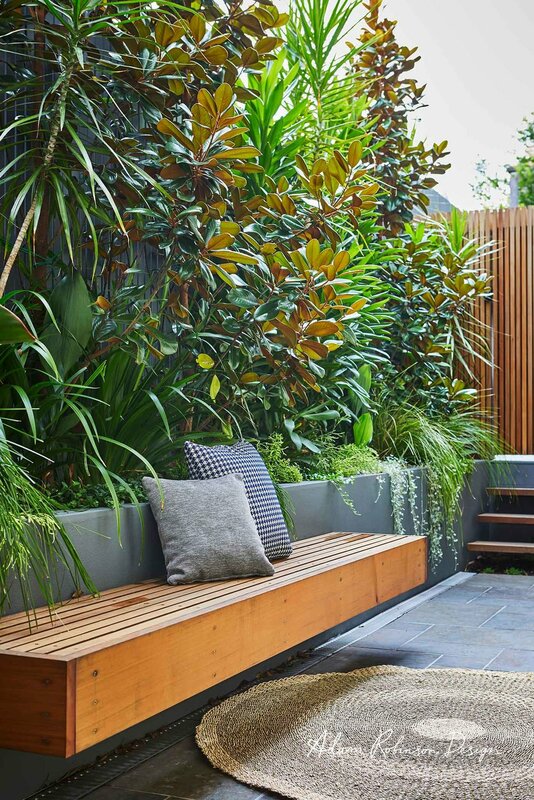 All the boundary walls were painted a dark gray colour to help the plants to really pop and evoke a cosy ambience. A large port-hole mirror suspended on the wall in the dining area bounces light and reflection around. The selection of green foliage plants was based on a relaxed and laid-back approach but with loads of texture and movement, juxtaposed with the two cloud topiaries for some subtle disruption and theatre. 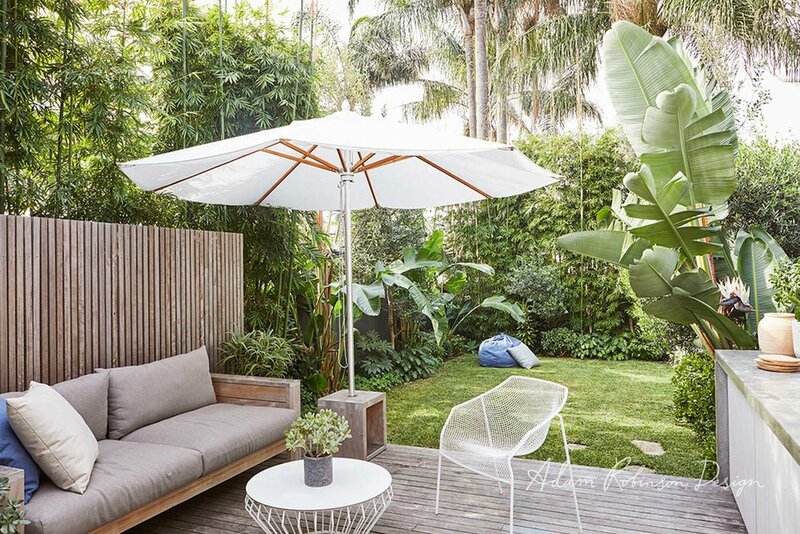 The tonal colours in the garden keep the space feeling serene and soft, and in combination with the patterned tiles under the benches and the cloud trees create a sophisticated, yet playful garden that feels really great to be in.